Joplin News First: Shots Fired at Parr Hill Park - Neighbor Grazed by Bullet Interview LIVE! Shots Fired at Parr Hill Park - Neighbor Grazed by Bullet Interview LIVE! (Joplin MO - 64804) -- Joplin's Parr Hill Park this afternoon is the location of a shooting. This is a developing story and Shannon Becker of Joplin News First has LIVE! interviews with eyewitnesses, neighbors, 2 people who were grazed by bullets and Joe of the Joplin Police Department. Information develops that a vehicle with possibly 3 occupants shot at the basektball court. Eyewitnesses allege it began as targeted gunfire, 3-4 shots, near the intersection of East 17th Street and South Kansas Avenue. After this LIVE! report JPD released information, that eyewitnesses had alluded to. “There was more than one person firing a gun.” Eyewitnesses alleged that the initial gunfire was returned with retaliation shots. One female who declined to show her face or be identified on camera tells Joplin News First LIVE! that she was standing in her front yard on South Kansas with her children and father-in-law. She heard shots ring out initially while in her yard. "As a first responder I immediately thought 'someone might be hurt'" and as she turned and it all was unfolding just down the street she was grazed by a bullet on her right arm, above her elbow. The bullet didn't break the skin but in our LIVE!cast she shows us the holes that the bullet cut in her sweatshirt she had just put on to go outside on a lovely Sunday afternoon with her kids and play in the yard. Other eyewitnesses have reported seeing Police in the immediate area questioning young men who might be involved or have information. Joplin Police Department has asked the public to stay away from this area as they are talking to eyewitnesses and gathering evidence. The Joplin Police Department declined to comment if somone had been detained or arrested as part of this incident. A second young lady talks to Joplin News First LIVE! had also come outside her residence after hearing the initial shots fired. In the video she shows a bloody mark above her left ankle where a bullet grazed her and broke the skin. She did not need medical treatment but spent a lot of time talking with Joplin Police Department and Detectives. This is a developing story. Thank you for sharing this on your Facebook page. Joplin News First reports on what happens in the 64804 & 64801. 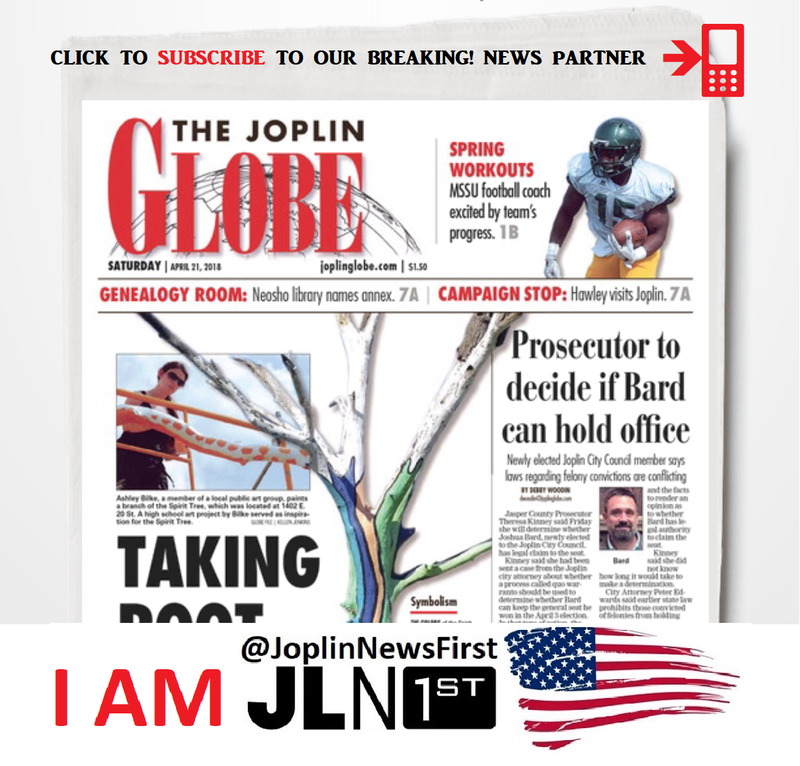 If it's important to you, then it's important to us at Joplin News First - because you live where we live. © 2017 Joplin News First. Breaking news, stories and events that matter to you in the 64804 and 64801. (64804) — Joplin News First have confirmed with the Joplin Police Department. Shots Fired at Parr Hill Park. Officers are still on the scene.